Destiny changing Progressive Jackpots, roaring Free Spins and bitting cash prizes… Mega Moolah Slots Machine calls you to no download Savanna full of toothy bonus features and killing wins. 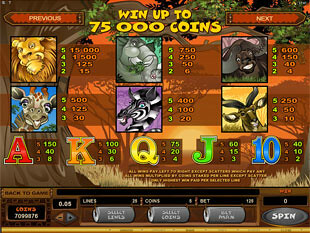 Launch the game to make dangerous, but gainful trip to the wild Africa and try your luck here. Who knows maybe today it’s you to become the next king of the slot and… millionaire! 5 reels and 25 paylines of true wilderness and furious animals… Try to survive and not to become dinner. Just start your prize hunting and find out who you are predator or prey. Just unleash your ravenous animal instincts to win all cash prizes here! Lion is the king of beasts and a wild symbol. Only this strong and fast animal has power to replace other symbols of the game to create more winning combos. Also, this wild king doubles delicious prize each time when substituting. To hunt down and bite cash prizes you need to make a stake. Here you can play your cat-and-mouse game setting 5 coins per line. Besides, you are free as a wild beast to choose the coin size from the range $0.01, $0.02 and $0.05. But if you are eager to seize the most tasteful jackpot of $18,750 then you have no choice, but to play with the highest bet of $6.25 per spin. 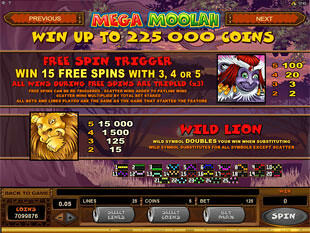 It’s not high risk, so, just fix the max stake and try to hit 5 symbol of wild Lion to taste the profitable prize-prey. Free Spins. 3 or more weird Monkeys can call 15 Free Spins to get as much more roaring coins without paying for it! So, manage to catch scatters and prize hunting starts! Besides, during the feature all your wins will be tripled. 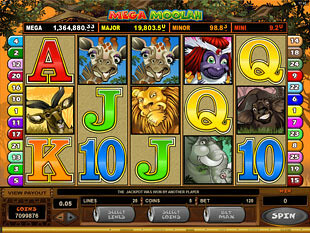 The slots Africa is pretty hot… Oh, by the way, manage to catch at least 3 Monkeys again to prolong the gainful hunting and re-trigger Free Games! 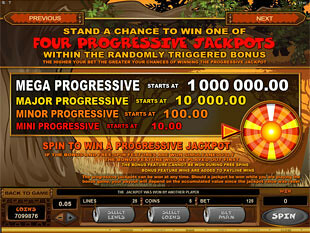 Progressive Jackpots. The most tasteful prey is the biggest one of four Progressive Jackpots here. But remember that you can hunt the prize at the end of any spin made. Besides, every second each progressive jackpot awarded grows until… Somebody bite it. So, why not you? Just play the game to check if the fortune loves you today and it’s you to hit the largest $1 million random cash prize. Can you seize it?